Wow, just wow. Give me a second here. Okay, here you have, in my opinion, simply the GREATEST console shooting game of all time. It's simply the most incredible game I've ever played. It's just, just, wow. I don't know the history of this masterpiece, so I'll just go on with the review, suffice to say that whatever I write will not be able to do this justice. 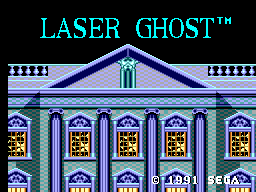 In Laser Ghost you play the part of an unknown hero of sorts that has to save a little girl named Katherine who is trapped in a world of ghosts. Sounds lame? Guess again, because not only is this game eerie and disturbing, but it's incredibly well done. See, Katherine's soul has been stolen by spirits and it's up to you to help her escape them, get her soul back, and get the hell away from the terrors she will face. The opening story is frightening to say the least, and then you are thrown into the game proper. Be certain to play this game with the Light Phaser, and not the control pad, otherwise you'll get destroyed in a second or two. Interestingly, you don't control Katherine, you PROTECT her as she walks around the haunted house, shooting at obstacles, traps, spirits, and boss creatures, to name a few things. Katherine has a certain amount of life to pay attention to, but you'll often find hearts to increase the meter if it gets too low. At the bottom of the screen, you'll also notice a little girl figure that is constantly moving along a line. That's simply marking your progress in the levels. When she gets to the end, get ready for a showdown with a boss. The bosses are wonderful, like animated suits of armor, a haunted painting, a hanging corpse, a cemetery filled with zombies, it's great. Just keep everything away from Katherine and you'll do fine. I guarantee it will take you several plays to get through this game, but it's more than worth it. You also have some special shots in case things get too overwhelming. They can help significantly, especially during boss fights with the likes of the haunted portrait or the zombies. It's a very well put together game, quite unusual and unique. Perhaps the best game I have ever played to make use of a console accessory. Incredible, simply incredible. The graphics in this game are really, really good. Some of the best you'll ever find on the SMS. The colors are placed perfectly and everything moves so fluid that there is simply no room for improvement. Well done. Again, just wow. Very fitting. Sometimes not exactly creepy, but it's just so catchy that it doesn't matter. I don't know who the genius was behind this game, but they really laid it all out for you. 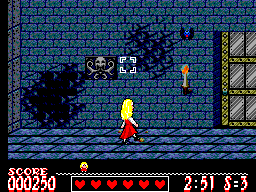 The controls are sometimes a bit sketchy, but that's mainly because there are normally so many enemies flying around that you sometimes accidentally shoot Katherine by mistake. 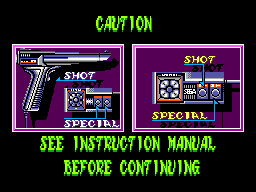 Be careful to start the game using ONLY the control pad, not the Light Phaser, otherwise it will be inoperable and you'll wonder what the hell is going on. You can play with the control pad if you want, but I don't suggest it, it will make the game a gazillion times more difficult. I can't stop playing this game, and once I finally get through it the entire way I know I'll come back to it again and again. There aren't many Light Phaser oriented games for the SMS, and the ones that do exist can simply not compare with this masterpiece in video gaming. If you're looking for one or two Light Phaser games to collect, this simply has to be one of them. In conclusion I order you to purchase this game immediately if you want to even vaguely consider yourself at one with the awesomeness. This game is prerequisite to becoming a more perfect human being.